Summer is just around the corner, which for most people means at least some time off work. Yet, for parents, summer brings its own conundrum – what to do with the kids? Many schools have nearly ten weeks’ holiday and very few working parents can juggle that much time off work. Summer schools are a great solution and you don’t need to look too far. Many of the well established Swiss boarding schools run such academic summer programmes, which may be sports based, language skills focused or a mix of the two. Nearly all are residential, which may not initially be what parents based in Switzerland are looking for, but just consider the advantages. A residential programme at a leading international summer school is a great way of giving a child their first taste of life away from home, in a safe and secure environment - a great concern for parents wishing to send their child to summer school in Europe. Most children crave independence and autonomy whilst many parents dread it, so this way, everyone’s happy. Usually, summer schools’ programmes are very international and provide a great opportunity to make friends from all over the world. Countless lasting friendships have been forged over a secret midnight feast in the boarding house! Living together, even for just a couple of weeks, is a very intense experience, particularly since many activities take place in the evenings. At 130-year-old Brillantmont International School in the centre of Lausanne, our academic summer course has been in existence for nearly 35 years. It is open to boys and girls aged 11-16 from all over the world, including Switzerland. For several, it is their first time away from home and for children living in Switzerland, knowing that mum and dad are not too far away, makes the “first time” much easier. Remember that Switzerland is very diverse geographically, so for children coming from Zurich or Basel, two weeks in Lausanne is something of an unknown and is a great opportunity for them to cross cultural divides. The Brillantmont academic summer course is very flexible since students choose a stay of two to six weeks, which they fit around their family holiday. Small class sizes ensure rapid progress in English or French and the experienced teaching team make the learning experience fun and interactive. Afternoons are given over to sports in the school’s new multipurpose sports hall, including basketball, tennis, volleyball, zumba or on lake Léman, waterskiing or windsurfing. The week is crammed full of activities and trips - whether it be to visit a chocolate factory, to join a photo workshop, to hike on a glacier or to abseil down a rock face. The summer course students have an action-packed time at Brillantmont and the course is great value for money. Paradise found... in Lausanne, Switzerland! Paradise has never been so close as during a great Swiss summer when the sun is usually present, the lakes are cool and inviting and the mountain air is invigorating and fresh. Festivals, concerts, sports events and folkloric celebrations fill the months of July and August and the fact that many students return year after year, with some choosing to join the school year is proof of the great times they have. So, don’t let the holiday planning panic set in! 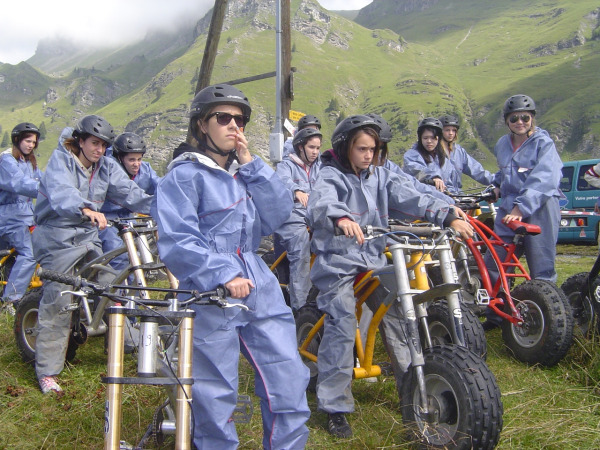 Check out Swiss summer school opportunities and you’ll find a world of possibilities. The only drawback is, parents can’t go too!